Due to changes with Medicare and Medicaid, New Mobility reports in its June issue that U.S. wheelchair users will find that getting the durable medical equipment (DME) they need will be slower, harder and costlier. "Restrictive documentation policies as well as outdated 'in-the-home' language that governs claims decisions in the Centers for Medicare and Medicaid Services (CMS) are creating hassles for DME dealers and consumers," according to New Mobility. 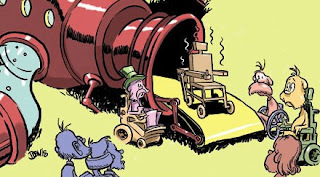 "What's worse, power wheelchair reimbursements made by Medicare — already reduced by 27 percent in January 2007, will be reduced by another 19 percent on July 1 due to Medicare's national competitive bidding program. Since private insurance companies follow CMS' lead, these new policies portend a growing nightmare of denials, delays, red tape, and economic hardship for DME dealers and end users alike." The story gives the example of Abbie Freedman of Santa Rosa, Calif., who has used a wheelchair for 22 years due a T5 spinal cord injury at age 39. Medicare has covered any new wheelchair she has needed -- until now. Now in her 60s, her shoulders have deteriorated and her doctor recommended she get a power wheelchair rather than have surgery that would be a difficult recovery. Her doctor prescribed specialized physical therapy and the power wheelchair. She ordered the wheelchair and was told by the manufacturer that Medicare would cover it. "Anxious to get on with saving her shoulders, she paid for it out of her own pocket, then filed a claim for reimbursement with Medicare," New Mobility writes. "She received the chair in September 2004 but was surprised when her claim for reimbursement was denied." "I'm not sure I would have ordered it had I known Medicare wouldn't pay," she says. "$6,320 is a lot of money." Freedman has been trying for four years to get the wheelchair reimbursed, with no luck. "After nearly four years, they sent me back to square one," she said of the original claim form that she was asked to fill out again four years later. "The system is a joke, but it's not funny." In honor of the Americans with Disabilities Act's 18th year in effect as of July 26, the Census Bureau has released its most recent data about disability in America. It reports that 41.3 million people have some level of disability, representing 15 percent of the civilian non-institutionalized population 5 and older. By age, the Census reports that 6 percent of children 5 to 15 have disabilities, 12 percent of people 16 to 64 have disabilities, and 41 percent of adults 65 and older have disabilities. In terms of using or needing assistance, it reports that 10.7 million disabled people 6 and older need personal assistance with one or more activities of daily living (such as taking a bath or shower) or instrumental activities of daily living (such as using the telephone). As for specific disabilities, the Census says that 2.7 million people 15 and older use a wheelchair, another 9.1 million use an ambulatory aid such as a cane, crutches or walker. It reports that 1.8 million people 15 and older report being unable to see and 1 million people 15 and older report being unable to hear. In the area of speech difficulties, 2.6 million people 15 and older have some difficulty having their speech understood by others. In the area of MHMR, 14.3 million people have limitations in cognitive functioning or have a mental or emotional illness that interferes with daily activities, including those with Alzheimer's disease and mental retardation. This group comprises 6 percent of the population 15 and older. In terms of employment issues, 11.8 million of 16- to 64-year-olds report a medical condition that makes it difficult to find a job or remain employed. They comprise 6 percent of the population this age. But 56% of people 21 to 64 with some type of disability were employed in the past year. The rate ranged from 82% of those with a non-severe disability to 43% with a severe disability. For those without a disability, the employment rate is 88 percent for the same period. In the area of income, $22,000 is the median earnings for people with a non-severe disability. This compares with $25,000 for those with no disability and $12,800 for those with a severe disability. But 18% of people with a non-severe disability did have household incomes of $80,000 or more. By comparison, 26 percent of people without a disability had household incomes of $80,000 or more, with the same being true of 9 percent of those with a severe one. In terms of living arrangements, 60% of people 25 to 64 with a non-severe disability live in married-couple families. The corresponding rates are 68 percent for those without disabilities and 50 percent for people with severe disabilities. And 23% of people with a non-severe disability live alone or with non-relatives. This compares with 28 percent of those with a severe disability and 19 percent without a disability. In the arena of education, 33% of people 25 to 64 who had a non-severe disability were college graduates. This compares with 43 percent with no disability and 22 percent with a severe disability. And 2.2 million of undergraduates had a disability, as of the 2003-04 school year. These students represented 11 percent of all undergrads. In Internet use, 36% of people 15 to 64 with a severe disability use a computer and 29% have the Internet at home, respectively. The respective figures for those without a disability are 61 percent and 51 percent. The Census reports that 96.5% of transit buses were ADA lift- or ramp-equipped, as of 2005. This represents an increase from 61.7 percent in 1995. The Washington Post reports that a rash of home break-ins has apparently targeted deaf people who live near the college for deaf people, Gallaudet University, in northeast Washington, D.C.
"At least eight burglaries or attempted break-ins have been reported in the past two weeks, police said. Laptops, cellphones and cameras have disappeared; in one incident, thieves made off with a midnight snack from the refrigerator," The Post reports. The D.C. police department's Deaf and Hard of Hearing Unit, in which all members know sign language, is working with the victims so they can communicate with police officers, as well as educating them about personal safety. The Guardian in the UK has a great story about a family's pride representing eight generations of British deaf people. The Smith family has inherited deafness for eight generations, but today's family members say that thanks to technology, many of the challenges faced by their ancestors no longer apply. They say they are proud of their deaf heritage. Sandra Smith says: "Our family has eight generations of deafness. The earliest deaf relative we have traced is Thomas Smith, who was born in 1824 in Bisley. He was my great-great-great grandfather. He is recorded on the census as being 'deaf and dumb,' which is what deaf people were called in those days. When my sister and I found Thomas and realised that deafness in our family went back to the early 19th century, we just froze. It was such an amazing feeling - to know that we came from such a strong deaf line had a big impact on me. "Technology has changed the experience of deafness over the generations, even in my lifetime. We didn't have a telephone when I was growing up. It was before the invention of the minicom textphone or fax or mobile texting, so deaf people had no access to telecommunications. We would have to go to the neighbours and ask them to make the call for us. We would only phone if there was a really important reason. If the neighbour came knocking on our door to say there was a call for us we always knew it was bad news. "We have sign language and deaf culture as a link through the family, but I don't think it matters if a child is deaf or hearing. I have five children: four are deaf and one is hearing. My hearing son signs too, so we all have that common language and bond. I would like to see deafness and deaf culture carry on in our family for future generations, though. That's important to me." Steven Jacquez and his guide dog Ivanna were refused service at a Vallejo, Calif., restaurant May 25, which is a violation of the Americans with Disabilities Act (ADA). Apparently unaware of ADA protections, the owner of Momo's American Cuisine told Jacquez and Ivanna, a yellow Labrador Retriever, to leave, citing potential health code violations. 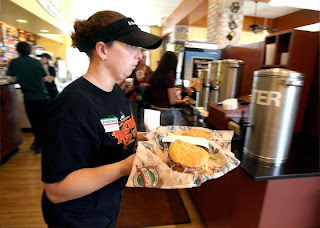 As the Vallejo Times-Herald correctly reported, "refusing to serve a blind person accompanied by a guide or service dog is illegal under the Americans with Disabilities Act. Federal law allows people with disabilities to bring service animals into customer areas, and requires that they receive equal service." Jacquez, who is legally blind, said he showed a waitress his laminated, pocket-size version of the ADA, but was asked to leave. The owner told him, "No Dogs. Get out." The police were called and the restaurant owner received a lecture about the ADA. Although this is a small story in one town in America, I applaud the local newspaper for covering it. The more the issue is covered, the more business owners will know that guide dogs must be allowed admittance. 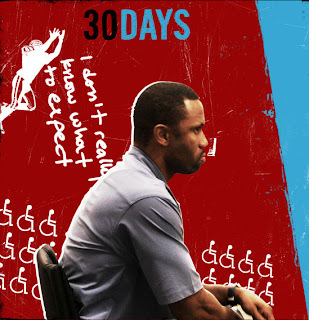 Retired NFL football player Ray Crockett will spend 30 days in a wheelchair for the FX TV network show, "30 Days," on June 10. I had real misgivings about this episode when I first heard about it but have since found out that a friend who is a wheelchair user was a consultant for this episode, and was able to review a final edit. He says they did a good job. The premise of the Morgan Spurlock show (filmmaker of "Supersize Me") is that he or someone else spends 30 days living someone else's life as closely as possible. One of my favorite episodes was when he and his girlfriend tried to live 30 days on minimum-wage jobs. It really drove home what the working poor must deal with. Ray Crockett says it was an incident that occurred during his pro football years that made him want to participate in the June 10 episode. In 1991, he was playing for the Detroit Lions when his teammate and friend, Mike Utley, was part of a play that left him paralyzed from the chest down. FX says "it is this incident that made Ray want to participate in 30 Days." "For 30 Days, Ray will live in a wheelchair and will rely on his mental discipline to keep his legs immobile," according to the FX Web site. "His home and his car will be retrofitted to accommodate his needs. Coaching duties for his son's football team will continue and Ray will join the Texas Stampede, the wheelchair rugby team featuring players made famous in the documentary film 'Murderball.' He will attend a weekly support group for paraplegics at the Baylor Institute of Rehabilitation and meet with a physical therapist to monitor any potential side effects." During his wheelchair use, Crockett will be monitored by a doctor to track any muscle loss, blood clots, pressure sores or other side effects that could happen while he is a wheelchair user. Not having seen the episode, I can't comment on it yet, but I can give advice to the FX Web site content producer -- drop the term "wheelchair-bound" from the description of the episode, please. Finally, I have to give some praise to Time magazine for using proper terms when describing this episode: "Whereas they inflame differences, 30 Days gets people to live the life of someone else, from a wheelchair user to an animal-rights activist." 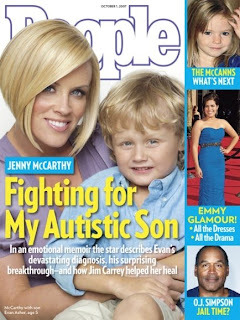 Led by actors Jenny McCarthy and Jim Carrey, the DC Rally for Autism will be June 4. The Green Our Vaccines Rally will begin in front of Sylvan Theatre on the Washington Monument grounds with a march that will last until 12:30 p.m., according to Talk About Curing Autism (TACA). Rally organizers say their message is "We are not anti-vaccine, we are anti-toxins. Green our Vaccines!!" Participants will "demand Congress take action to Green Our Vaccine Supply while reassessing our current vaccine schedule. Ask Congress to reenact legislation that would eliminate mercury and other toxins from our children's vaccines, study the instance of autism and other neurological disorders in vaccinated versus unvaccinated children, and to extend the statute of limitations to allow all children affected by vaccine-induced autism to file in the National Vaccine Injury Compensation Program (NVICP)." 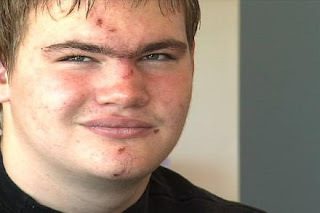 One West Virginia family says they are going to the Rally because they believe a vaccination gave their son autism, WSAZ reports. "We want to clean these vaccines up, make them more environmentally friendly, make them where they're not going to hurt our children," said Bridgette Nelson, whose son was diagnosed with autism. Nelson says it wasn't long after her son Parker's shots at 15 months that she noticed something was wrong. "He had run a slight fever after the vaccinations, but I didn't think anything of it," said Nelson. "You know kids run fevers all the time, but about a week after that he just completely stopped talking." After several months, he was officially diagnosed with autism. "Gradually, I started piecing it together. He got sick after his vaccinations and about a week later everything changed. He was a completely different little boy then," said Nelson. The Washington Post reports on a Baton Rouge, La., teen, Elizabeth "BB" Blanchard, who was diagnosed with leprosy, which is now called Hansen's disease. The story is very thorough in covering both Blanchard's story and the history and stigma of Hansen's disease. The Blanchard family and everyone at BB's school received an in-depth lesson about leprosy after her diagnosis. And even in modern-day America, the old fears and stigma about the disease reared their heads. The Blanchards found they were in the correct location to educate themselves because the National Hansen's Disease (Leprosy) Clinical Center, part of the U.S. Public Health Service, is in Baton Rouge. "Founded in 1894 as a state leprosarium in nearby Carville, La., the center is considered the premier research and treatment facility in the world for leprosy," The Post reports. About 300,000 new cases of leprosy are diagnosed each year around the world and it affects 2-3 million people internationally, according to the World Health Organization. "Where it is left untreated, Hansen's disease is a leading cause of disability and devastating deformity," The Post says. "It remains endemic in Bangladesh, India, Brazil and elsewhere." In the United States, about 6,000 people have Hansen's disease, with 100-200 new cases reported each year. About 60 percent of the new cases are found in California, Louisiana, Massachusetts, New York and Texas. Studies report that about 95% of humans are naturally immune to leprosy. The Post reports that the wealth of information on the Internet has helped erode some of the stigma of the disease, which is easily treatable where the anti-leprosy drugs dapsone and rifampin are available. But misinformation about biblical disease that in the old days banished people to quarantine colonies continues to occasionally appear: In February an Arkansas television station aired an incorrect story saying that recent cases of leprosy among immigrants from the Marshall Islands could grow into an epidemic affecting Americans. "The item was later corrected by the television station, which chalked it up to bad information from some local doctors, but not before it was publicized online by the Drudge Report," The Post says. As for BB Blanchard, now that she is well, she says she's not sorry for the experience. "At my last doctor's appointment, I told my mom that I am kind of happy I have this," she says. "I learned a lot about this disease and got more educated about it. I also find it really cool that I am part of the 5 percent of the world that is not immune to leprosy. Why me? I don't know. But it has been a really cool experience having a biblical disease." BB and a friend are even planning a science project leprosy for the next school year: "This is the perfect thing to educate my school and everyone about it," BB says. "I have really great knowledge about it now." "The Love Guru" goes overboard with little people jokes? in the new Mike Meyers film, "The Love Guru." You know it's potentially over-the-top when movie reviewers who know little about disability issues complain about insulting jokes. The Slate magazine podcast about popular culture reviewed the new Mike Meyers movie, "The Love Guru," which comes out June 20, and said the repeated jokes at the expense of little people really annoyed them. 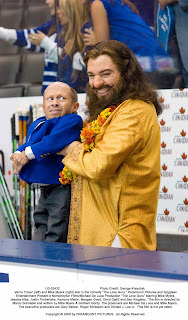 The Trailer Spotting blog also questioned the old repetitive comedy in the upcoming Meyers movie: "How many comedies can you built on jokes about midgets, dicks and promotion for the Toronto Maple Leafs?" TheScreengrab blog also complained: "It’s clear that Mike Myers, the one-time Gen X comedy staple come animated franchise emperor, needs to stop going back to the well as the well is full of nothing but annoying silly voices and midget jokes." The film's plot: "Pitka (Mike Myers) is an American who was left at the gates of an ashram in India as a child and raised by gurus. He moves back to the U.S. to seek fame and fortune in the world of self-help and spirituality. His unorthodox methods are put to the test when he must settle a rift between Toronto Maple Leafs star hockey player Darren Roanoke (Romany Malco) and his estranged wife. After the split, Roanoke's wife starts dating L.A. Kings star Jacques Grande (Justin Timberlake) out of revenge, sending her husband into a major professional skid - to the horror of the teams' owner Jane Bullard (Jessica Alba) and Coach Cherkov (Verne Troyer). Pitka must return the couple to marital nirvana and get Roanoke back on his game so the team can break the 40-year-old 'Bullard Curse and win the Stanley Cup." The Hindu community has already registered its problems with the film. U.S.-based Hindu leaders spoke out against The Love Guru in late April, saying it has a "potentially offensive and religiously insensitive premise," according to E! online. Critics in India came together in early May to ask that the film be banned altogether from the country's cineplexes. A representative for the influential Mumbai-based Janjagruti Samiti and Sanatan Society for Scientific Spirituality says the film "plays into stereotypes and potentially ridicules the religion's beliefs." Even the trailer includes some of the jokes at the expense of little people. not use the unit he was shown in 2006. A federal judge in Baltimore is allowing a would-be Towson University student’s lawsuit over accessible housing at a dorm that was built in 2000 to go forward, The Daily Record in Baltimore reports. The university, the residence hall’s developer and its management firm all argued that federal laws didn't apply to Mark Kuchmas’ lawsuit over design and construction issues once the building had been up for two years, even though Kuchmas did not see a unit until January 2006. U.S. District Judge Richard D. Bennett decided May 28 that "the time to bring suit under the federal Fair Housing Act and other laws starts ticking at the time of the alleged discriminatory action, not when construction of the building is completed." The Daily Record says that "while Bennett’s May 15 ruling appears to have nudged the case toward settlement, question of the time limit is far from settled and could be the subject of U.S. Supreme Court consideration before long, according to attorneys in this case and others." “It’s probably as important an issue that exists today under the Fair Housing Act, and I think you’ll see more litigation, more cases dealing with it,” said Andrew D. Levy, Kuchmas’ attorney. The 4th U.S. 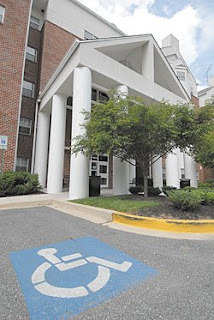 Circuit Court of Appeals, which includes Maryland, has not ruled on how the statute of limitations is applied to design and construction claims under the Americans with Disabilities Act or the Rehabilitation Act. Kuchmas sued under those two federal laws, too. The guide for Beijing Olympic volunteers in dealing with people with disabilities, Skills for Helping the Disabled, which had patronizing comments about disabled people, has been pulled from the official Beijing 2008 Web site, according to the Australian Broadcasting Corporation. The Australian Paralympic Committee wrote to the International Paralympic Committee about the manual, which raised the issue with the Beijing Olympic Organizing committee (BOCOG). The deputy head of the Australian Paralympic Committee, Jason Hellwig, told Radio Australia that although the manual's language is inappropriate, he doesn't believe it reflects attitudes among Chinese Games organizers. "We were surprised because it's very out of step with the dealings that we've had with BOCOG, the experience that our athletes have had in China and Beijing, Hong Kong and Qingdao specifically over the past few years," he said. Among the offensive statements in the guide was: "Disabled people can be unsocial, stubborn, controlling and defensive." CNN reports May 29 that scientists have created a way for a robotic arm to be controlled directly from sensors implanted in the brain. The new technology could one day be used to allow people who are paralyzed to operate prosthetics and other devices by just using their brains. Scientists have trained a group of monkeys to use the new technology to feed themselves marshmallows using a robot arm controlled only by sensors implanted in their brains. Lead researcher Andrew Schwartz of the University of Pittsburgh said he believes the technology will be tested in humans soon, but that it will be longer before the devices are used in actual people with disabilities. "I think we'll be doing this on an experimental basis in two years," said Schwartz, professor of neurobiology at the university's School of Medicine. 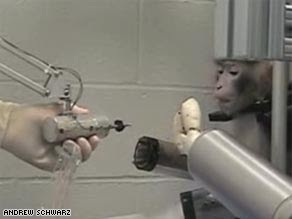 "The arm is controlled by a network of tiny electrodes called a brain-machine interface, implanted into the motor cortex of the monkeys' brains -- the region that controls movement," CNN says. The scientists' findings were published in the journal Nature May 29. The Rolling Exhibition: "a photo documentary that narrates a story of human curiosity" by Kevin Connolly will be at the Kennedy Center Hall of States from May 29 – July 20, 2008. Connolly has traveled the world on his skateboard, photographing the stares of others. Connolly, who was born without legs, has documented more than 32,000 photos of the stares he attracts. “The job of any photographer, or anyone who can call themselves an artist, is to make people question what they do on reflex," he says. "To make people question a value or an idea that's so common, that people haven't really looked at it yet. And so, right now, what I'm standing for-it's that." Connolly, who will soon graduate from Montana State University, says he has always been ambitious and independent: "My parents made the decision to not put me in a wheelchair or a hospital. They just took me home." VSA arts, in partnership with the Smithsonian Institution, will present a talk by Kevin Connolly on June 2, 2008, 12-1:30 p.m., at the S. Dillon Ripley Center Discovery Theater. For more information on The Rolling Exhibition, visit therollingexhibition.com. In his first extensive comments about his disability, NY Gov. 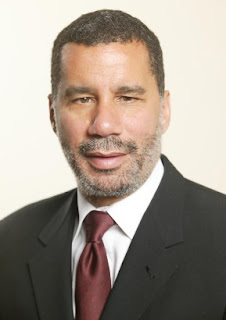 David Paterson, who is legally blind, tells The AP that "his unlikely ascension has taught him to embrace his disability." He also hopes being a high-profile blind person will other disabled people becomes more comfortable with their own disabilities. "The concentration that I have had to engage to make this adjustment sometimes feels overwhelming," Paterson told The Associated Press on May 28. Two weeks ago, his disability was on public display when at a news conference, with cameras shooting away, he pressed his face close to the bill he was to sign as he searched for the signature line. The New York Times ran the photo very large in the next day’s edition. "A number of people were actually upset that I was exposed that way by the picture," Paterson said. "But I felt very good about the picture because when I was younger, if I dropped change, I would never pick it up. I wouldn’t even attempt to, because I had a problem with people watching me crawling on the floor, looking for change. "Only in the last few years of my life am I comfortable having people see me display that I have a disability," Paterson said. 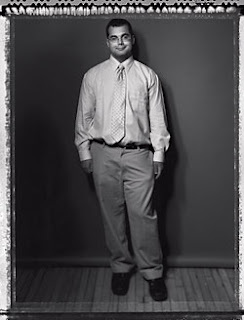 The blindness community is also welcoming his openness about his disability. "It’s always encouraging to see someone like David Paterson succeed because he does give blind people, who maybe didn’t have exposure to successful blind people, some hope going forward," said Chris Danielsen of the National Federation of the Blind. Paterson says, "I had been, on occasion, accused of trying to hide my own disability. But now, to be able to be myself and have it known ... I think there are a lot of people who have a lot of different problems who feel more empowered. If that’s the case, I’m feeling pretty good about that aspect of the job." and faces losing her home in Des Moines. "In the midst of the worst surge in mortgage defaults in seven decades, foreclosures in U.S. towns where soldiers live are increasing at a pace almost four times the national average," a Bloomberg exclusive report finds. "Foreclosure filings in the 10 towns and cities within 10 miles of military facilities, including Norfolk, Va., home of the Navy's largest base, rose by an average 217 percent from January through April from a year earlier. Nationally, the rate was 59 percent in the same period, according to RealtyTrac, which tallies bank seizures, auctions and default notices." The largest rise in foreclosures was in Columbia, S. C., home to Fort Jackson, where the Army trains the military before they are sent to Afghanistan and Iraq. Properties in some stage of foreclosure rose 492 percent from a year earlier, RealtyTrac said. "The second-biggest increase was 414 percent in Woodbridge, Virginia, next to the Marine Corps Base Quantico," Bloomberg reports. "Foreclosure filings tripled in the cities surrounding Norfolk Naval Base and the Camp Pendleton Marine Corps Base near Oceanside, Calif., RealtyTrac said. Havelock, N. C., site of Marine Corps Air Station Cherry Point, saw foreclosures more than double." 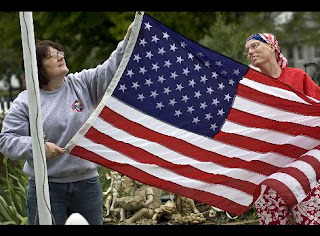 Monique Kelly, a disabled Iraq War veteran, said in the story that she is close to foreclosure on her home in Maryland. "The former Army staff sergeant in the First Armored Division paid her May mortgage bill halfway through the month and said she won't be able to make June's payment for her house in Owings Mills, Md," Bloomberg says. "Kelly, designated disabled by the VA because of post- traumatic stress disorder, said she bought the property in January for $305,000 and had to spend $10,000 fixing structural problems that were not disclosed to her. " A new British publication, Walks on Wheels, gives 15 descriptions and maps of walks around the Cotswolds Area of Outstanding Natural Beauty to let people on wheels explore quiet country paths, villages and market towns there. "All of the routes have been tested by disability and access groups from across the Cotswolds and have been carefully chosen to ensure that they are appropriate for users," according to the Wiltshire Gazette & Herald. 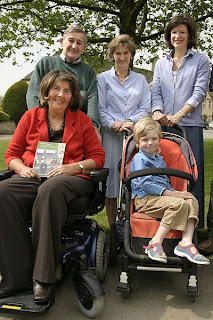 Walks on Wheels is also available for download here. When many churches in America continue to be inaccessible, it's good to read about someone who is continuing his ministry after becoming a wheelchair user. It can go a long way to making parishioners aware of accessibility issues. 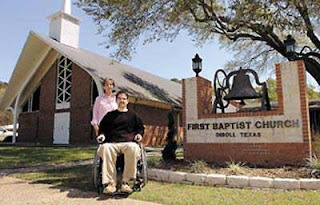 After a hunting accident left Gary Fannon, 44, as a wheelchair user, he said he questioned whether he should continue his calling as a Baptist minister in Diboll, Texas, but decided he should and he returned to preach at First Baptist Church Easter Sunday. "While he preaches from a wheelchair now instead of standing behind a pulpit, he said the preaching is no different," The Baptist Standard reports. But a conversation with another minister gave him the answers he needed, he said. “I shared with him that I was thinking it might not be fair to the church to stay on as pastor. He pulled his chair up close to me and looked me right in the eye and asked: ‘What can you not do from that chair that you could do standing up? You’ve been called of God to be an example before God’s people and deliver the message he’s given you to deliver. Can you still do that?’ That was a big affirmation to my ministry,” Fannon said. He says being disabled may even make him a better pastor. “Pastors, we preach about faith all the time, but often our lives are so insulated, we don’t really have to live it, but now I have to live it every day. When I talk about enduring and persevering, I’m talking to me, too,” he explained. And persevering he is. He has yet to receive an accessible van, so he rolls the 1.2 miles each way from his home to the church each day. The teacher at Morningside Elementary School teacher, Wendy Portillo, apparently called for the vote because of Alex's disciplinary problems. She has removed from classroom duties after the incident, according to St. Lucie County School district spokesman Janice Karst. 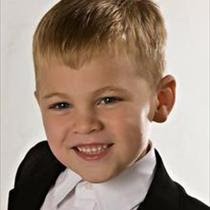 Alex Barton's mother, Melissa, says Alex is currently being tested for Asperger's Disorder, a type of autism. Before the vote, his classmates said what they didn't like about Alex, calling him "disgusting" and "annoying," Melissa Barton said. "He was incredibly upset," she said. "The only friend he has ever made in his life was forced to do this." "I never thought she would subject my child to such mental abuse," Barton said of the teacher on WPTV. Barton says she is considering legal action, and Alex won't be returning to the elementary school. He starts screaming when she takes him with her to drop off his siblings at school, she said. Cambridge, Mass., Friends School first grade teacher, Maggie Doben, has been working with early childhood students to help them to explore and understand physical disabilities as part of an anti-bias curriculum. Now she has produced and directed a film about teaching young children about disability called "Labeled Disabled." According to the film's Web site, Doben found that even young children already have stereotypes and discriminatory behaviors about disability. She developed curriculum in which the children learn all about physical disability and meet people with a wide variety of disabilities so they learn what are biases and stereotypes and what are the real experiences of people with disabilities. "Labeled Disabled" illustrates how the "children's understandings are transformed as they participate in carefully designed lessons and engage in opportunities to meet and learn from disabled role models in their community. They are able to express their feelings about disability as they collect new information and deepen their knowledge." The film received input and support from the Cambridge Commission for Persons with Disabilities (CCPD), the Watertown Commission for Persons with Disabilities, the Perkins School for the Blind, Helping Hands, the Fidelco Dog Guide Foundation and Cambridge Friends School. Watertown, Mass. You can watch a trailer here. 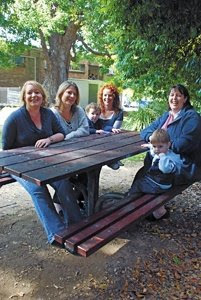 The mothers are part of the parent-led Blue Mountains Action and Support Group in a more rural part New South Wales and try to assist other parents of children with autism in finding resources, The Blue Mountains Gazette reports. "A lot of us have already been through it and there's a real resource base here — we know pediatricians, we've used speech therapists," says Sarah Kelly, whose 10-year-old son Caius has moderate autism. "We're here and we understand how hard it is." "When a child has just been diagnosed parents are in shock. They really need support," said Dee Conlon, mother of six-year-old Ethan. "It's at a time when they have to motivate themselves to get the services for their child, and I think a lot of the time people go into denial and don't even accept the diagnosis because it's too big." Punchline Magazine has a Q&A interview with Maysoon Zayid, an Arab-American comic who grew up in New Jersey and also has cerebral palsy. The article says her status as a disabled person "provides not just the industry but also society with a unique voice rarely bestowed upon disabled Americans. In her words, she’s the 'first shaking comic without a drug problem.'" Her career as a comedian is beginning to ignite, mostly due to her own hard work and innovation. 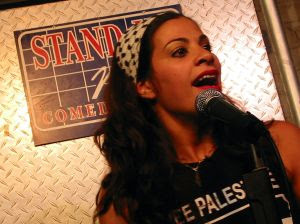 In 2002, she and comic Dean Obeidallah started the New York Arab American Comedy Festival, which still runs each year in New York City. In 2008 she has been a subject of the PBS documentary "America at a Crossroads: Stand Up: Muslim Comics Come of Age," has a role in Adam Sandler’s latest movie, "You Don’t Mess with the Zohan," which comes out June 6, and finds time for her charity, Maysoon’s Kids, an organization she founded in 2001 to provide assistance to oppressed children in Palestine, where her family is from. In August, Zayid will serve as a performer and delegate at the Democratic National Convention. And her one-woman stage show, Little American Whore, is about to be turned into a film. Although being Muslim and having cerebral palsy are a large part of her act, she doesn't feel she's filling a too-narrow niche as a comic: "I’m a Jersey girl at heart. So when it comes down to it, I feel like the stuff I do is really relatable. I don’t think that when Arabs are no longer in style, I won’t be; I think it’s because I have so many different facets of my personality— whether it’s being Muslim or Palestinian or a Jersey girl or disabled or single and in my 30s. I have so many different areas to draw from that I don’t think I’ll ever hit a wall." Autism activists are asking Pope Benedict to discuss autism after a Minnesota Catholic church banned a 13-year-old boy, Adam Race, who has autism, from attending services, Christianity Today reports. The Race family has worshipped at the Roman Catholic Church of St Joseph in Bertha, Minn., since 1996, but the week of May 16, Rev. Daniel Walz of the Church of St Joseph obtained a restraining order against Adam and his mother, Carol, because of "disruptive behavior" and out of "a growing concern for the safety of parishioners." According to the Minneapolis Star Tribune, "Walz, the church's pastor for three years, said in an affidavit that as Adam has grown, the situation has worsened, and the boy has been 'extremely disruptive and dangerous' since last summer. Walz alleges that Adam struck a child during mass and has nearly knocked elderly people over when he abruptly bolts from church. He also spits and sometimes urinates in church and fights efforts to restrain him." Carol Race told the Star Tribune that the family of seven typically sits in either the church's cry room or in the back pew to avoid disrupting other parishioners. "He (Rev. Walz) said that we did not discipline our son. He said that our son was physically out of control and a danger to everyone at church," she said. "I can't discipline him out of his autism, and I think that's what our priest is expecting." "The family continued attending mass", she said in the Star Tribune, "trying to calm Adam and leaving during the closing hymn to avoid interacting with other parishioners on the way out." No pope has ever talked publicly about autism, according to Christianity Today. Compulsory education for children with disabilities, which currently only applies to elementary and middle school, will be extended to include kindergarten and high school in 2010, the South Korean Ministry of Education, Science and Technology said May 25, according to Chosunilbo. In 2011 and 2012, children aged 4 and 3 will be able to enter special education classes. The Ministry said education authorities will carry out disability tests from time to time so that children with disabilities can be detected early and enter education programs. "Before the new law, it was the parents’ responsibility to detect any disability in their children and find and pay for the right education facility," Chosunilbo reports. "Also, parents had to pay for the entire cost of special education for disabled children under three, and the government only partially funded the cost of regular education." People with disabilities in Bangalore, India went to the polls May 10 and found no Braille-enabled voting machines or ramps at the polling booths, according to One World South Asia. In the world’s largest democracy, people with disabilities say they face many barriers when trying to vote. “Less than a month after the state chief electoral officer gave an assurance to disability activists, there is no sign of Braille strips on voting machines or ramps on the polling booths,” says Paul Ramanath, secretary Karnataka Angavikalara Rajya Okkoota (KARO), a state-level alliance of disability groups supported by ActionAid. “Despite a standing directive from the Supreme Court and a mandate from the Chief Election Commission, voters with disabilities in Karnataka faced inaccessible polling booths and voting machines sans Braille,” confirms Victor John Cordeiro, program manager of ActionAid’s Disability Unit. “I had to be lifted along with my wheelchair by no less than four people to get across the steps at the entrance of the polling station. There was no ramp as usual,” says Manjula, a wheelchair user who works with a leading international Business Process Outsourcing company. “It was a day full of expectations so far as disabled people in the state are concerned, but when I went to vote I had to seek assistance in climbing steep stairs to the polling booth,” says C. Mahesh, also a wheelchair user, works for the Community Based Rehabilitation Forum, as the Advocacy Coordinator in promoting the rights of persons with disabilities. 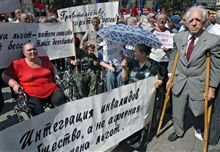 Disabled Russians protest in 2004. Radio Free Europe reports May 26 that even with new laws in Russia designed to give disabled people there more access to society, many are left out due to continuing architectural, educational and employment barriers. In Russia, employers are legally obliged to hire a certain percentage of people with disabilities. But Dania Galiullina, a spokeswoman for Tatarstan's Labor and Employment Ministry, says most employers simply ignore the law. "Companies that refuse to employ disabled people have to pay fines," Galiullina says, "but the amount of the fine is so low, most companies prefer to accept that they are breaking the law and just pay the fine." According to the United Nations, 14 million Russians are disabled, but they are only gradually being integrated into Russian society. But the new Russian president says he wants to make it a priority. At Perspektiva, a disability rights NGO in Russia, its director Denise Roza's top priority is to trying to persuade the government to adopt the new UN convention on disabled rights. She says the new Russian president, Dmitry Medvedev, said in a recent speech that he wants to take greater steps to help the country's disabled population. "This was an issue we did not talk about at all for a long time," Medvedev said. "But the situation is changing now, and the state has made this issue one of its priorities. I think we have more opportunities than before because society is starting to change, rather a lot, and it seems to me that these days it's difficult to force someone to stay at home. Also, you see more and more disabled people on television, on the streets. You see more and more how people who are disabled are leading ordinary lives." The Australian newspaper The Herald Sun reports that the Chinese volunteer guide for people helping with the Olympics and Paralympics has some insulting assumptions about people with disabilities. "Disabled people can be unsocial, stubborn, controlling and defensive," the official Beijing Olympics guide says. The Olympic manual for volunteers in Beijing adds that that physically disabled people are "often" mentally healthy. Volunteers are told not to call Paralympians or disabled spectators "crippled" or "lame," even if they are "just joking" because "disabled people can be defensive and have a strong sense of inferiority." The guide says disabled people "show no differences in sensation, reaction, memorisation and thinking mechanism from other people, but they might have unusual personalities because of disfigurement and disability. For example, some physically disabled are isolated, unsocial, and introspective; they usually do not volunteer to contact people. They can be stubborn and controlling; they may be sensitive and struggle with trust issues. Sometimes they are overly protective of themselves, especially when they are called crippled or paralysed." The guide does tell the volunteers to "show respect when you talk with them. Though life has handed many difficulties to them, disabled people are often independent and self-reliant." Australian Olympic swimming champion of the 1960s, Dawn Fraser, says in the article that she wasn't surprised by the patronizing comments in the guide. She said she saw disabled athletes spat on in the streets of Beijing during university games there in the mid-1990s. In honor of Memorial Day weekend, The New York Times magazine did an in-depth story on a soldier who returned from the war with a severe brain injury and a tenuous road to recovery. The article focuses on the story of Sgt. Shurvon Phillip, who cannot speak and can barely move any part of his body due the brain injury he received from the explosion of anti-tank mine under his Humvee in Iraq. The NY Times reports that "along with a broken jaw and a broken leg, Shurvon suffered one of the war’s signature wounds on the American side: Though no shrapnel entered his head, the blast rattled his brain profoundly. "Far more effectively than in previous American wars, helmets and body armor are protecting the skulls and saving the lives of U.S. troops in Iraq and Afghanistan. But according to the Defense and Veterans Brain Injury Center, a joint Defense Department and V.A. organization, about 900 soldiers have come home with serious traumatic brain injury, or T.B.I., which essentially means dire harm to their brains; it can be caused by explosions that deliver blunt injury to the helmeted skull or that send waves of compressed air to slam and snap the head ruinously even at a distance of hundreds of yards from the blast." According to several tests, Phillip's cognitive functioning is probably OK and he can read and comprehend material. Ironically, after writing about this fact so hopefully, the article's author Daniel Bergner reveals his own biases about serious disabilities, saying that faced with Phillip's scenario, he might prefer to be dead. "Sometimes impossible to overcome, too, was the idea that Shurvon’s life might not be worth living; that I, in his place, would rather stop breathing, cease thinking, that I would prefer to die," Bergner writes. Bergner then problematizes this thoughts by telling of the wonderful life Phillip has with his loving family of his mother, Gail, sister, Candace, niece, Kyla and nephew, Malik. "Whenever this idea took hold, I recalled a medical ethicist at R.I.C. (Rehabilitation Institute of Chicago) telling me about studies showing that doctors and nurses tend to rate the quality of life of severely impaired patients to be far lower than the patients do themselves. The ethicist had spoken, then, about the ways that a life acquires meaning. "And I thought about Malik scrambling onto Shurvon’s bed to show him pictures, and about Malik and Kyla curled and comforted on the floor below him. I thought, too, about a kind of exercise that Shurvon’s family discovered recently by chance and that Gail described: with Shurvon sitting in a wheelchair in the driveway, his nieces and nephews tossed inflatable beach balls, one pink and another blue, softly toward him, and he tried to move his arms to bat them back. “'They were cheering like at a baseball game,' Gail said, remembering the first time the children did this. ‘Yeah! Go on Ya-Ya!’ Beach balls and high voices of excitement floated in the air around him." Ari Ne’eman, 20, who has an Asperger’s diagnosis, runs the Autistic Self Advocacy Network, and has used the forum to counter an ad campaign he called “the oldest and most offensive disability stereotypes to frighten parents.” New York magazine profiled the autism rights movement in its May 25 issue. ransom notes that said: “We have your son. We will make sure he will not be able to care for himself or interact socially as long as he lives. This is only the beginning.” It was signed “Autism." Like other disability groups, stereotypes of people with autism are hurtful in their misrepresentation that adults won't be able to live and interact in their community. Ne'eman says. He began a letter-writing campaign against the ransom note campaign and recruited support from the major U.S. disability groups and received coverage from the New York Times, The Wall Street Journal, and the Washington Post. About three weeks after the ad campaign began, they were pulled. "It was a signal triumph for the neurodiversity movement, the self-chosen name for the autism-rights brigade," New York explains. "Autism advocates are an entirely new category: The whole idea didn’t really exist five years ago. Moreover, rather than advocating for a cure, or seeking research into the cause of the much-publicized 'autism epidemic,' these activists argued that society needed to change, not autistic people." The article also features other autism-rights spokespeople: Jim Sinclair, who has produced essays on the topic, Judy Singer, an Australian whose mother and daughter have Asperger’s and who is on the spectrum herself and who coined the term neurodiversity; and American writer Harvey Blume. 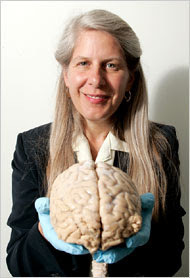 Jill Bolte Taylor, a neuroscientist who worked at Harvard’s brain research center, experienced bliss and a kind of enlightenment when she experienced a stroke in 1996. According to the NY Times, her new book, My Stroke of Insight, chronicles her sense of contentment after the stroke affected the functioning of the left side of her brain. “My perception of physical boundaries was no longer limited to where my skin met air,” she wrote. Using her scientific knowledge, "she brings a deep personal understanding to something she long studied: that the two lobes of the brain have very different personalities," The NY Times says. "Generally, the left brain gives us context, ego, time, logic. The right brain gives us creativity and empathy. For most English-speakers, the left brain, which processes language, is dominant. Dr. Taylor’s insight is that it doesn’t have to be so." A label magnified with the Quicklook Focus. According to the NY Times Novelities column May 25, the old-fashioned magnifying glass has been upgraded to a hand-held video device that can benefit people who have low vision or are losing their vision. These newer lightweight, portable devices weigh about 9 ounces or less and can enlarge the print on closeby or more distant objects. 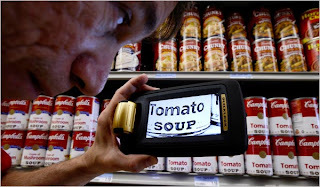 For example, users can pass the magnifier over a menu in a poorly lit restaurant, for example, or aim it at a product on a grocery store aisle. Dr. Bruce P. Rosenthal, chief of low-vision programs at Lighthouse International in Manhattan, which provides services for people with vision loss, said, "the portable magnifiers, with their built-in illumination and powerful electronics, have many advantages over traditional optical devices like magnifying glasses." in New Orleans about the cleanup there. The BBC's Ouch! podcast May 21 interviewed the folks from "How's Your News," who reported they are busily preparing their six shows for MTV. "How's Your News" began in 1994 as a project at Camp Jabberwocky, a summer camp for people with disabilities. 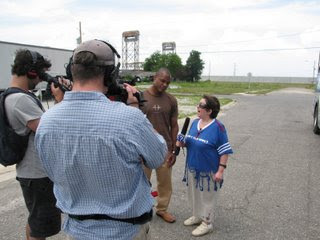 From the video class at the camp, there arose a news broadcast and then five of the reporters set off across the country interviewing everyone they met, with their own unique set of questions. Their work as roving reporters was captured on film, which played on HBO, PBS and won awards at numerous film festivals. After a successful "On the Campaign Trail" show in 2004, MTV showed interest and greenlit the series in 2007. The "How's Your News" reporters started a blog in February to chronicle their adventures making the six-part series for MTV. "How's Your News" has a great spirit, filled with humor, joy and the reporters' intense interest in the world around them. And how can you go wrong with reporters who ask all the fun questions that others never think to ask. You can see their reports on their YouTube channel. Jerry Berrier tries out a Braille sign on the trail. The Stony Brook Wildlife Sanctuary in Norfolk, Mass., has designed a nature trail for people who are blind or visually impaired. It has a guide rope, informational plaques in Braille and large text signs on its new Sensory Trail, which opens May 29. The Boston Globe reports that its intent is to give blind people the ability to "experience nature in solitude" like everyone else. Jerry Berrier, a retired Verizon worker, helped the Massachusetts Audubon Society create the trail's accompanying audio tour, but says as a blind man, he will love the unique opportunity to walk the trail alone and independently. "I'd like to have time to be by myself a little bit," he said. "I'd like nothing more than Elaine to dump me off at the start of the trail and say, 'OK, see you in half an hour.' "
thousands of people without critical treatment due to both lack of state funding and also a state law that prevents many people from receiving mental health care. I am glad they are covering the story, but I hate to tell them that the mental health system in Texas has been in crisis for at least 20 years. When I was a medical reporter in Texas in the 1980s, I did many stories about the lack of resources for people with mental illness. In fact, some administrators in the MHMR system were rumored to have used "bus therapy" on people with mental illness, which meant they bought someone a bus ticket to send the person to another funding jurisdiction. Sad, sad. With a massive deficit looming, the 78th Texas Legislature cut mental health services by only allowing three types of mental illnesses to be treated on a long-term, outpatient basis: bipolar disorder, schizophrenia and major depression with psychotic features, KPRC-TV reports. According to to the American Psychiatric Association, about 300 diagnosable mental illnesses exist. "In limiting access to individuals, in particular those that I work with that are homeless, to three diagnoses, you leave out an entire population," said Anthony Love, president of Coalition for the Homeless of Houston/Harris County. Deputy chief of psychiatry for the Harris County Hospital District, Dr. Britta Ostermeyer, says "limiting funds for outpatient mental health care creates a surge of people continually going into crisis." The KPRC-TV investigation shows that "a lack of funding has led to a staggering lack of bed space in Harris County. This, in turn, causes those with mental illness to clog ER's, jails, courts and is feeding the chronically homeless population." Canadian architect Ron Wickman grew up with a father who used a wheelchair and learned as a toddler that his father couldn't enter many buildings through the front door because of their inaccessibility, or many homes at all. Wickman, a national expert in accessibility and barrier-free design in Canada, wrote an article about the need for more barrier-free design in Canadian Architect magazine. "My father and I rarely entered a building in the same way as the majority of others; the service entrance was the norm for us," he writes. "We were also less likely to visit friends at their homes." So in his career as an architect, he advocates for home visitability and universal access to public buildings. "I now realize how easy it is to design a building or space to be more usable by more people, including persons with disabilities," he says. "The concept of 'visitability' is one of the simplest and most economical approaches to universal design that can address homeowners' and community needs over time, contributing to a more flexible and sustainable built environment. Visitability ensures that everyone--regardless of mobility--will be able to at least visit someone else's home and use the washroom." For more information about visitability in Canada, go to Visitability Canada. In the USA, go to Concrete Change. says she's overjoyed that America may one day have accessible money. In fact, the Bank of Canada is about to begin making new accessible money because the money it introduced in 2001, which has raised bumps in a corner of each bill to indicate monetary value, is beginning to wear out, the Canadian Press reports. Canada's paper currency doesn't use Braille but the raised markings are arranged in patterns that a blind person can feel to identify denominations from $5 to $100. The raised markings were added to the Canadian Journey series of bank notes in 2001 after consultations with Canadian blindness groups. The markings on the money were treated with a polymer to help them endure but through use they've been flattening out and becoming unreadable. The money also has features for Canadians who have low vision such as larger numbers and contrasting colors. "The tactility features on our notes have generally been well received by the blind and visually impaired community," said Monica Lamoureux, a spokeswoman for the Bank of Canada. "There are, however, improvements to be made, and the bank will be looking at the accessibility features in the design process for the next series of notes which the bank plans to issue beginning in 2011." 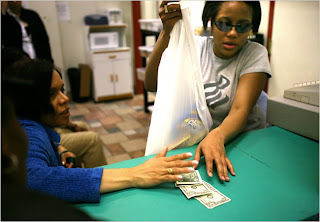 The USA lags behind Canada in the area of accessible money, but the U.S. appeals court ruling May 20 should force the American government to change its paper money because the court said U.S. money's uniform size and color discriminates against blind and visually impaired people. The New York Times reports that many blind Americans are extremely happy with the ruling. James A. Kutsch, the president of the Seeing Eye Inc. of Morristown, N.J., a nonprofit guide dog school, said the ruling will mean greater independence for people who are blind or visually impaired. “Currently, identifying money requires either the assistance of another person or use of technology,” he said, referring to portable or computer-based scanners that read aloud the denominations of paper money but can cost more than $250. 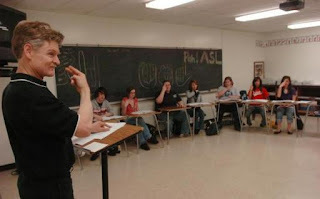 Mike Collier teaches his sign language class. Mike Collier, the American Sign Language teacher at Frenship High School in Lubbock, Texas, says being deaf has been a blessing. He was working as an 18-year-old machinist when a work-related accident left him deaf. "I am deaf with a capital D," Collier says. "That means I embrace the deaf world as my world. My wife and I are deaf, and all our interaction with the world is pretty much through our eyes. Becoming deaf was a blessing in disguise for me - not at the time, but in the years to come." He now introduces high school students to the world of deaf culture through his sign language class. The course started during the 07-08 school year and is among the fastest-growing programs there, according to the Lubbock Avalanche-Journal. For most students in the Frenship sign language classes, Collier said he is their first encounter with a deaf person. Collier got the job at Frenship after he asked about helping the school set up sign language classes, and the school evaluated the idea and found students were interested in sign language classes. Students receive foreign language credit by taking the class. Students say the class is teaching them about the deaf community as well, because Collier requires students to attend deaf events to practice their skills and to learn about deaf culture. 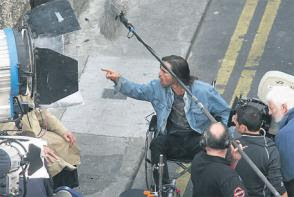 Colin Farrell filming in Dublin May 20. Irish actor Colin Farrell plays a wheelchair user in the independent film, "Triage," now filming in Ireland, The Independent in Ireland reports. The film is set in both Dublin and Kurdistan and tells the story of an Irish photographer (Farrell) who returns home after working as a war correspondent in Kurdistan. The film also stars Paz Vega and Christopher Lee. Bosnian Danis Tanovic directs "Triage," which is based on the novel by Scott Anderson. Tanovic's 2001 film, "No Man's Land," won an Oscar for best foreign film, according to The Hollywood Reporter. The tabloids have been reporting on Farrell's dramatic weight loss, which he reports is for his role in "Triage." Caleb Moyo, a former freedom fighter who uses a wheelchair, says he travels in the road to let people in Zimbabwe know about the inaccessibility there. 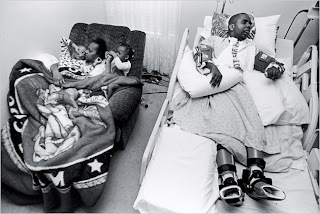 "I wanted to instill in their minds, the plight people with disabilities face in this country. Like any other Zimbabwean, I am entitled to use the road, but no provision has been made for people who use wheelchairs," he said in an interview with the Zimbabwe Guardian. Moyo says at the Compensation House in Harare, the only access for people with disabilities to a senior Government official's office is through steep uneven stairs. "I bluntly refused to be bundled up the stairs. Instead the meeting was held in one of the offices at the ground floor," Moyo says. Zimbabwe's physical environment, especially in towns and cities, remains inaccessible to many people with disabilities, he says. "The problem lies with the policymakers. In fact, as far as I am concerned, they do not know we exist. It is funny that after 28 years of Independence, the problem of people with disabilities is still being addressed as if it's something new," he said. Moyo said in the end people with disabilities are not able to contribute to the development of the country because the "system does not accommodate us." Zimbabwe has an estimated 1.3 million disabled people. The Kenya National Survey for Persons with Disabilities found that 5% of Kenyans have some kind of disability, about 1.5 million people. The survey done by National Coordinating Agency for Population and Development and the Kenya National Bureau of Statistics looked at the number of people with disabilities, their distribution, the nature of their disabilities and their causes. The survey evaluated problems faced by those living with disabilities and how they cope with them, according to NationMedia. It looked at the services and rehabilitation programs available to Kenyans with disabilities. According to the World Bank, in developing countries, "disability can cause poverty by preventing the full participation of persons with disabilities in the economic and social life of their communities." The survey in Kenya found that the most prevalent disability was some type of visual impairment or problem with vision. 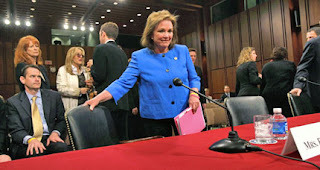 Elizabeth Edwards talks to a Senate committee about cancer. NPR's "Talk of the Nation" delved into public reaction when public people become ill or disabled in its May 23 discussion called "When Public Figures Get Sick." "These days, with 24/7 media, the illness of a public figure quickly becomes a major story -- for instance, the news this week that Sen. Ted Kennedy (D-MA) has a brain tumor. Another recent example is Elizabeth Edwards' battle with breast cancer," Tom Reagan writes of the show's Blog of the Nation Web site. "Often these illness can lead to a great deal more information about a particular illness making its way into the public mind share. Past examples include; the late-Mickey Mantle's liver replacement and what it did for raising awareness of organ donation; 'Magic' Johnson's battle with HIV/AIDS reduced the stigma associated with the disease; and the late President Reagan's battle with Alzheimer's made more people aware of it's debilitating effects." The show also discussed polio survivor FDR and the heart attack of President Dwight Eisenhower in 1955. This is a big deal that the national network news is treating a news source with a disability just like anyone else, and in a story that has little to do with disability. NBC Evening News with Brian Williams did a story May 23 about people cutting back on Memorial Day travel because of rising gas prices. Reporter Janet Shamlian talked to several people in the Atlanta area and one was presented as an "Atlanta mom" as Shamlian and she went to the grocery store to shop for weekend supplies. The Atlanta mom is Fran Whitaker, who also happens to use a wheelchair. Whitaker discusses her family's scaling back of weekend plans, by going to the lake, which is closer, than to the beach. The report makes no mention of Whitaker's disability and has some great shots of her and her kids shopping and loading the car with groceries. Just a regular shopping trip like anyone else -- that's great image that is most powerful because of its subtly. Thanks to Laura Hershey of Crip Commentary for tipping me to this. Joel Sidney, 26, graduated from UC Berkeley May 21 "with an almost perfect grade-point average, a bachelor's degree in American Studies, an honors thesis on Bay Area bluegrass music and the certainty that having autism is not going to limit his expectations," reports the San Francisco Chronicle. "It's been tough," Sidney said. "But I've gotten a lot of help." Sidney is one of about 700 undergraduates served by Cal's Disabled Students' Program, but one of only six who have autism spectrum disorders, and he's the only one who received his degree in May. Sidney says he turned his almost 20-year obsession with bluegrass music into an academic endeavor. His senior honors thesis was titled "Innovation and Tradition in Bay Area Bluegrass: Historical Review and Analysis of Distinctive Regional Features" and included a CD he produced with 20 songs by musicians such as Laurie Lewis, David Grisman, Sandy Rothman and Rich Wilbur. "My fanatical interest in bluegrass began when I was 9 years old," he wrote. "In 1991, my obsession was initially sparked during a concert at the Freight & Salvage Coffee House in Berkeley. ... We sat in the front row and I still recall that the band members appeared immense and seemed to be performing right in front of me for my own benefit." 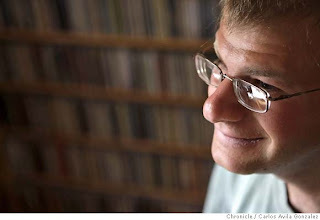 Christine Palmer, Sidney's faculty adviser and chair of his thesis committee, described his academic finale as "an impressive piece of Bay Area bluegrass historiography and music criticism." Connie Chiba, Cal's Disabled Students' Program's disability services coordinator, said, "I attribute Joel's success to having the characteristics of any scholar - being passionate about his major, willing to work hard, knowing the resources that he needs to use to succeed, and to being bright and motivated." Amanda Wothe, who has Down syndrome, will deliver a speech at the May 25 commencement at Perham High School in Minnesota, according to WCCO-TV. Wothe said she wants her classmates to always keep their dreams in sight, because anything's possible. "I have many of the same goals and dreams as you," Wothe said. "So, to many of you, thank you for your support and for being my friend." an upside to his epilepsy. The BBC You and Yours series asked What Disability Means to Me? and brought together several prominent British disabled people to discuss "how disability has affected their lives, and perhaps formed, or changed the kind of people they are." 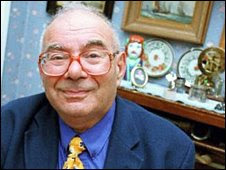 The BBC talked to Rabbi Lionel Blue, commentator Murray Walker, writer and poet Gwyneth Lewis, rugby player Kenny Logan, comedienne Liz Carr and the Archbishop of Canterbury. The BBC reports that its biggest surprise from the piece was "the almost universal reaction from our contributors that their 'disability' has improved them in some ways: made them more perceptive, more 'emotionally intelligent,' as writer Gwyneth Lewis puts it, while not claiming that definition for herself." The BBC does much good work on the topic of disability, with its program Ouch! and its news coverage, so I hope others in the media will follow its lead to allow disabled people to tell the world of their experiences in their own words. Voice of America (VOA), the multimedia international broadcasting service funded by the U.S. government, broadcast a report called "Inside the Complex Worlds of Deafness and Deaf Culture in America" on May 18. It's an in-depth story about deaf culture that will reach VOA's estimated worldwide audience of more than 115 million people. You can read the transcript or listen to the broadcast here. she is a dependable asset to the business. According to the Austin American Statesman, hundreds of special education students in Central Texas schools are transitioning into the community as paid, productive workers, primarily because of public school programs that prepare them for employment and employers who offer them jobs. "Half a million students in the state's 1,200 public school districts and charter schools are classified as having challenges ranging from autism and mental retardation to physical and emotional disabilities," according to Gene Lenz, deputy assistant commissioner for special programs with the Texas Education Agency. In 2008, 50 special education students took classes ranging from agricultural studies to culinary arts at the Clifton Career Development School in Austin. About 30 percent of the 536,000 mentally disabled Texans ages 21 to 64 were employed in 2005, according to state figures. "Studies show that special (education) students who worked during their school years are more likely to work after they leave the public schools," Lenz said. Austin High School student Matthew Wright, 21, says the money he receives from his job as a messenger for the Texas Senate will help him live on his own at some point. "I want to live independently," said Wright, who learned his workplace skills through Austin school district programs that train students with disabilities. "You have to pay your utility bills and your phone bills, and how can you order movies if you don't have money?" 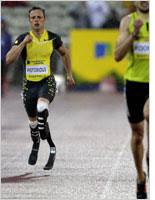 Science and technology columnist William Saletan for the online magazine Slate analyzes the recent ruling in favor of runner Oscar Pistorius competing in the Olympics within the context of today's more advanced technology of artificial limbs. In the column called "Leg Up. The emerging supremacy of artificial limbs," Saletan explores the paradox of the ruling: "Go, Oscar, go. We're all rooting for you to cross that finish line in Beijing. Just one note of caution: Don't win. That's the strange upshot of the court's ruling. Artificial legs are fine to run on, as long as you don't win the race." The Disability Law Lowdown Web site, ASL.DisabilityLawLowdown.com, launched what are believed to be the first-ever video podcasts in American Sign Language (ASL) on May 13, according to the Disability 411 blog. The Disability Law Lowdown ASL podcasts will bring information to the Deaf community by expanding traditional audio-only podcasts to include video that allows subscribers too see native Deaf speakers signing the show’s content. The podcasts will deliver the latest in disability law information every other week via American Sign Language, captioning, voice-over and transcripts to maximize accessibility. Free subscriptions to the ASL podcasts are available to have shows automatically delivered to MP3 players. Transcripts of the ASL podcasts also will be available on the Web site. For the fastest viewing, the ASL podcasts are available on YouTube at www.youtube.com/disabilitylawlowdown. The hosts for the ASL Disability Law Lowdown are native Deaf signers Danny Warthling and AJ Roupp. They will provide current information about disability rights and obligations under the Americans with Disabilities Act and other disability-related topics. Subscription is free and RSS feeds are available to automatically download the shows to video iPods, computers, phones and other video-capable devices. Disability Law Lowdown is provided by the Disability Business Technical Assistance Center (DBTAC), a national network of 10 ADA Centers across the country, offering technical assistance and training in the Americans with Disabilities Act and other disability-related laws. DCRE Labs developed the Disability Law Lowdown Web site and brought together several new technologies as part of the Disability Law Lowdown project. To subscribe, look for the ASL Disability Law Lowdown podcast on iTunes, or visit ASL.DisabilityLawLowdown.com. How are journalists doing covering disability? Disability themes breaking through in Hollywood?